21 Comments on "Easy Fudge Brownies Without Butter"
Incredible brownies… this is THE recipe! I’m going to try with less sugar, because they were a bit over sweet for me… but EVERYONE loves these as is! And soooooo easy! I am a huge fan of easy! Thank you so much, I’ll be trying more of your recipies, they all look great! Hi Jenny ! 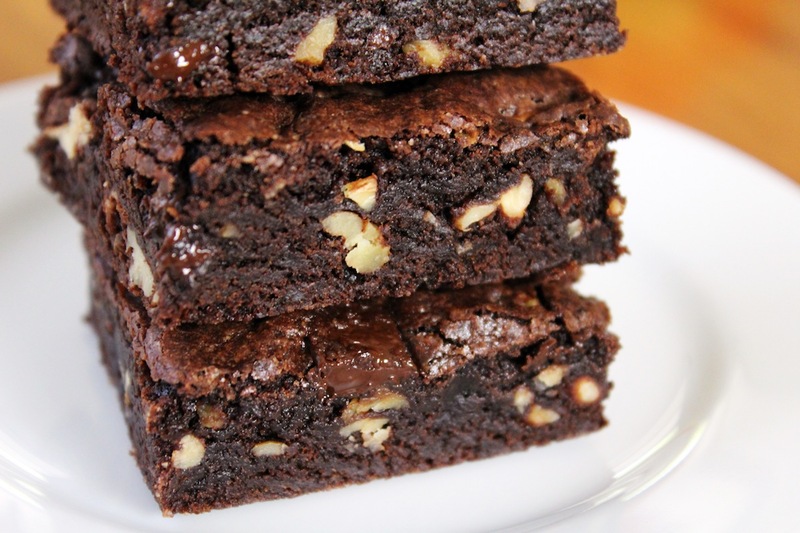 I watched the video on these brownies and I’m making them today. They look really easy and quite tasty. I love your colorful kitchen and all your utensils lined up. I’ve been a fan since I used to watch your talk show and I wondered where you went. So surprised and happy to have found you again ! Greetings from Santa Fe ! First of all ,thank you for all your videos they are all nice. Seeing your good spirit , and your colorful kitchen with good recipes is very fun and joyful. And I tried a lot of your recipes and they all turned out perfect. And for this recipes I used 1/2 cup of sugar ,and it still tasted sweet.May be next time I even use a bit less sugar . But it was really great and everyone liked it a lot. My question is ,if we don’t have the baking chocolate or the cocoa can it be substitute one for another ? In fact I didn’t have cocoa and just add the backing chocolate and it was still soooo good. I have only made this recipe the way it’s posted but it sounds like the substitution worked for you. Just made them… They are sooo chocolatyyy… 😉 I used 55% dark chocolate.. It was good though… I had sugar granules coating the top of the brownie.. Did I do something wrong? When I added sugar to the melted chocolate, it dint dissolve.. I tried melting the sugar along with the chocolate.. But Nothing much happened ..
What kind of sugar are you using? These look and sound amazing! I’ve found myself with limited ingredients and i don’t have cocoa powder. Is it still possible to cook these without cocoa and make a slightly sweeter one or any way to substitute it? Thanks. Baking is an exact science sand I have only made these brownies as posted so I’m not able to help plus I don’t want to guess and have it fail. These were terrible, extremely dry and not chocolatey enough even though I added more than was stated! There is no reason for these brownies to be dry unless the recipe is changed in some way. Either using a different flour, adding more cocoa, or over-baking might cause that. An oven that’s too hot or baking for longer than 20 minutes also might have caused it. I make these brownies often and they are never dry so I hope you will try again with these notes in mind, following the recipe exactly, and let me know how they turn out. Whenever a recipe calls for sugar, it is granulated white sugar. That is different from powdered sugar and it’s definitely not brown sugar. A recipe will always specify “brown” sugar if that’s required or it will say “powdered” sugar if needed. Powdered sugar is rarely used in baking batters but most often used to make frosting and glaze. You will get a better result with this recipe if you use white granulated sugar, the kind you might put into coffee. I have to tell you, you make cooking/baking so much fun. I LOVE to cook and bake, but to see you in the kitchen, to watch you cook/bake, to see all your gadgets…it’s just so much fun watching your videos. I read all of the comments that show under your video; I did not click the show more button to load more comments…SO, what surprised me is that no one mentioned your potholders. If you were serious when you said you made them, you know you now have to make just one special video showing how you made them. I had a pair of BEAUTIFUL blue potholders, but they caught fire. I can’t remember how, because I’m not a careless cook. However, I love the potholders so much I couldn’t bring myself to throw them away, even though they have holes in them due to being on fire. When I was a kid, I made potholders, the ones that came in a kit with the loom, bands, and crochet hook, but my blue ones that caught on fire were made similar to the ones you showed in your video. Mine even had a pocket on the front of them. Also, I’m VERY jealous of all the kitchen gadgets you have. Between electronic gadgets and kitchen gadgets, I don’t know which I love most. But, I love it that all of your gadgets, your utensils, your timers, are all so colorful, so funny, so cheery. I wish we still had a World Market here in my city, so that I could get the foods, cookware, etc. that you get at that Market. Anyway, keep doing the videos. You’re so funny. Because I’ve watched so many of your videos, I knew when you talked in this fudge brownie video about going to the dr. the day prior, and getting undressed in front of him, there was going to be a punch line about the dr not being one you would get undressed in front of, and I was right. I love it that you have that wonderful sense of humor. Take care, and please think about doing just one non-cooking video; a video showing how you made the potholders. Jenny, made it today and truly it is SO GOOD. Thank you for sharing all the “no butter” recipes. My life has more meaning now that I get to enjoy these! Your easy fudge brownies looks sooo delicious, i’d like to take a big bite, right now through the screen !!! So tempting, i think i’il make some this week end ! These look amazing. Can’t wait to try! BTW… your salmon cakes are now a weekly fave at our house. The fresh breadcrumbs make them PERFECT. Thanks for this site and your Youtube channel. Been watching you for years… this work is my favorite. Hi Jenny!.. 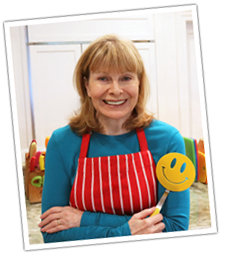 I LOVE your recipes especially the video’s…You are toooo funny!.. Why don’t you make more of them ????? Funny you should ask because I am making a video next week on these fudge brownies because they are so good and super easy.